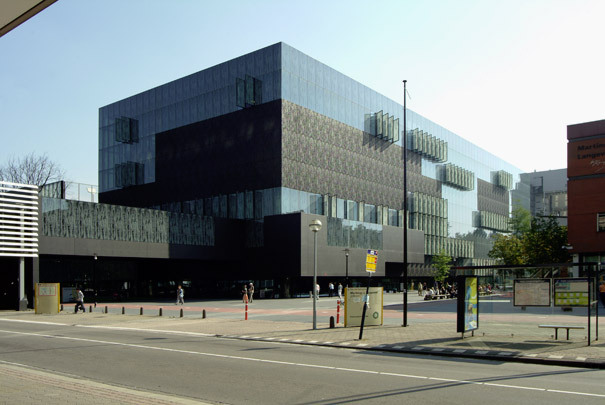 Parking facilities and a few shops supplement the normal duties of this new central university library. All assemble in a rectangular nine-storey block of concrete and glass. The issue desk is on the first floor with aerial walkways connecting it with neighbouring buildings. The depots and storage areas hang freely in the interior space like opaque clouds. Public zones, reading rooms, study areas and offices are dispersed over the upper floors in the open spaces among the ‘clouds’. Much of the facade glazing has a pattern of willow rods printed on it. This pattern is repeated as a relief on part of the concrete cladding.